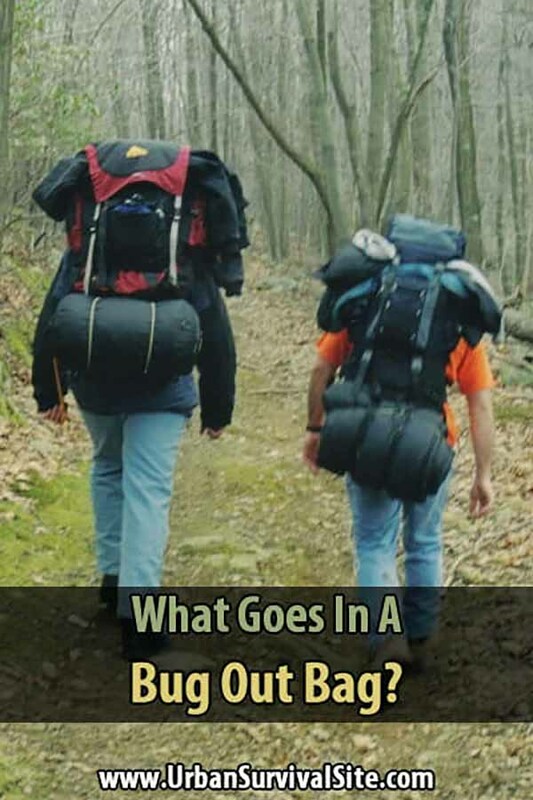 You are here: Home / Supplies / Bug Out / What Goes in a Bug Out Bag? Although this site is geared toward people who intend to ride out disasters in the city, there may be instances where you are forced to leave your home or neighborhood. There might be flooding, earthquake damage, a fire or any number of hazards that make your home unlivable. In case this happens, you need to have a bug out bag (BOB). What in the world is a bug out bag? A bug out bag is a portable bag that contains all the items that might be needed in a disaster. It needs to be light enough to carry, but large enough to hold everything you need. It’s a good idea to keep one in each vehicle and one near your front door. There are hundreds of thousands who probably wish they’d had a bug out bag when disaster struck, from the survivors of the Haitian earthquake to the victims of hurricane Katrina. By planning ahead, your life will be infinitely easier should you find yourself in a survival situation. You’ll probably have trouble finding a good bug out bag locally. 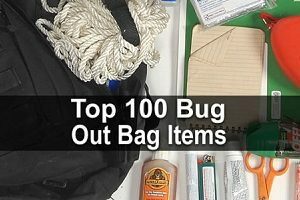 Even sporting goods stores don’t usually carry fully stocked bug out bags. But there are many places you can purchase one online. There are some decent 72-hour kits online, but I recommend making your own bug out bag. It’s cheaper, and it will meet your personal needs better. You can use any type of bag strong enough to hold the weight, such as a duffel bag. However, I think it’s better if you use a sturdy backpack, preferably one with an internal frame. A backpack won’t slow you down as much as an awkward duffel bag. Osprey makes some really great bags, but get whatever works. All kinds of goodies! There is no set list that everyone follows. Some of it depends on your personal preference. Use your judgment and try to anticipate some situations you might encounter and what items you would need. Bug spray. After hurricanes and floods there is going to be a lot of standing water which is a breeding ground for mosquitoes. The situation is even worse if there is a pandemic as mosquitoes are known for spreading disease. Camp axe. You might need this if you have to cut down small trees for shelter or split firewood. Camp cook set. Includes a stainless steel pot that’s perfect for boiling water. Camp soap. You’ll need this to stay clean, especially if you’re bugging out on foot. Compass. It’s not as easy to tell the direction by the sun as you might think, especially in the middle of the day. Keep one in your BOB in case you get lost. Contact Numbers. Write down the numbers of everyone know along with emergency numbers on a 3×5 card and have it laminated. Emergency whistle. One for each family member. This important if someone goes off alone to use the bathroom. Criminals sometimes take advantage of the lack of policemen during disasters. They can also help attract the attention of rescue crews. Extra Clothes. Everyone in your group should have at least one change of clothes. Socks are particularly important if you’re doing a lot of walking. I recommend SmartWool socks. Fire starters. Lighters are the obvious choice, but there are several other options such as waterproof matches, firesteels, optic fire starters, etc. First aid kit. When traveling on foot, going to new places outdoors, setting up camp or cooking food, people can be hurt very easily. Flashlights. You should have one in each bag. Only use one at a time so you don’t waste batteries. Speaking of which, pack several extra batteries, too. Folding shovel. Great for digging a fire pit or burying waste. Food. Energy bars are good, but you should also include some other high-calorie foods that don’t take up much space such as: beef jerky, nuts, rice, trail mix, tuna, MRE’s, etc. Hand crank radio. These take no batteries or electricity and can keep you apprised of weather, info, evacuation routes, etc. Hand sanitizer. You’ll definitely need this if you’re outside or with other people. Germs spread quickly when people don’t have access to showers, toilets aren’t working, and garbage isn’t being collected. Imodium A-D. If you or a family member gets diarrhea in a survival situation, the resulting dehydration can be life-threatening. Important Documents. Your photo IDs should be in your wallet, anyway. But make sure you also have copies of social security cards, birth certificates, house deeds, car titles, and any other important documents. Knife. There are many reasons why you might need a good knife when you bug out: making tools and tinder, adjusting gear, as a weapon, and so forth. Map of your local area. Forget using your iPhone or car’s GPS system in a survival situation. There’s a new kind of map that works without electricity! Money. Immediately after a disaster most people will still accept cash. If the disaster lasts a long time, eventually you may need some precious metals. Multi-tool. Not just for bug out bags. You should carry one of these almost everywhere. Multivitamins. You won’t get all the nutrients you need from your food or rations passed out by FEMA. Supplement your diet with these to keep your energy up and your immune system strong. Mylar Blankets. These thin, light blankets are waterproof and retain 90% of body heat. Paracord. This stuff is strong and light and can be used for all sorts of things. Personal Hygiene Items. Things like antiperspirants, combs, lotion, razors, shampoo, shaving gel, toothbrush, toothpaste, etc. Playing cards. In a survival situation, a lot of time is spent sitting and waiting. These are essential for fighting boredom. Poncho. If you need to keep moving even if it’s raining, you’ll need this. SAS Survival Guide. This guide will tell you everything you need to know about building shelter, finding food and water, staying healthy, getting rescued and more. And it fights right in your pocket. Signal mirror. You could use this for communication or you may need it if you’re stranded somewhere. Stainless Steel Water Bottle. This keeps water contaminant free and can easily be used for boiling water by hanging it over a fire with paracord threaded through the top. Sun block. Critical in case you’re stuck outside in the sun. A bad sunburn hurts badly and can become infected. Tarp. Can be used for emergency shelter or water collection. Toilet Paper. You don’t want to be without this! Water purification tablets. If you’re unable to boil water, you can purify it using iodine tablets. Waterproof case. You’ll want to keep have at least a couple hundred dollars in cash and coins on you. This will keep your money dry along with your phone, passport or other small items. Ziploc bags. Great for keeping things dry and preserving food. Pick up a few of these items on every shopping trip or order a few online every week. If you’re just getting started with survival preps, a bug out bag should be one of your top priorities. OK, here’s a wrinkle on a BOB that most folks have not considered, t is my main priority. I am an over the road truck driver. If/when I have to bail out, in a case where vehicles are no longer usable, I may have a long walk back to friends and family. Something in the order of thousands of miles is not out of the question. As well, I have to consider weather, terrain, resupply, and possible hostile “fellow travelers”. This makes a 72 hour bag a bit more of a challenge than for many folks. I have been reading a lot of these sorts of articles to try and distill what is needed, what is wanted, and what to avoid. I would prefer the option of sheltering in place, but that probably wouldn’t be much of an option. Another thought is the old axiom of planning for the worst, hoping for the best. If I am facing a natural disaster, of limited scope, that is one thing. If it is a situation of societal breakdown, (not as far-fetched as it may sound, think EMP) then I want to get to a location I know will be as safe and survivable as possible. A daunting mission when your BOL is a thousand miles away. Just some thoughts. Thanks for your effort in putting this list together, as well as the 50 items you forgot list. every one has a valid point on BOB’s. it comes down to personal preference, yes basics are always there. Write you guys are. My BOB started out as a Book Bag, at Wall Mart, And I added a belly belt from the strap off of a Duffel. 3 pair socks Very importent. Medical pack, self-made. Is in a belly pouch. Gorp 1LB in small bags “raisins, nuts and Dried fruit. Cook set, Sm.pot and 2 cups. 3 Flashlights – 1 headlamp – 1 Cap light – 1 regular. And a good pocket knife. Also, carry a summer/fall sleeping bag. Or winter if needed. And I have a metal Gold pan “16” on the outside of my pack. lived in or just outside of the city all my life. You can’t just go camp anywhere. You will run into trouble. So many people talk about BOBs that are not BOBs, the above list is only a hiking kit, nothing special, people hike 3-14 days with them before resupply. A BOB is to get you to your next shelter when you have to leave home. Hotel, motel, friends/relatives house. There is very little reason to camp in the woods unless for pleasure. James, thank you!! I thought I was the only one who didn’t see a purpose in evacuating to the outdoors. We hope to shelter-in-place. If not, we’d go to a local hotel/motel. If we had to evacuate a greater distance, we’d go to my MIL’s (250 miles away), friend’s house (same area as MIL), or hotel out of town/state. To be clear, in what I am about to say I don’t mean to question your survival abilities. However, BOBs are often called a 72-Hour bag. Most bags are only supposed to get you where you will be safe. If society collapses then you grab your bag and start the journey to your safe house/area. The bag has to be light and only full of things for 2-5 days. I am also a bit confused as to why you did not list a tent or sleeping bag but instead included a tarp and blanket. While these can be very useful, they do not have as much value without a tent or shelter of some sort. Also, to not just criticize, I saw many useful things that I had forgotten to get for my bag like the map, great idea! Thanks! I never tire of reading what should go into a “bug out bag” as to date no one has made any valid attempt to take into account the time of the year or the geographical area the person who may need a BOB lives or the area they are in when a situation arises. If I were to put a list together the contents would probably differ from day to day depending on where I was at the time, who I was with and the climate at that point in time. The main item overlooked on many occasion is water and second to that is proper nutritional food. Forget about most of the other stuff because in the main you will only need to use the contents of your BOB for about three days until you either get home, help comes or you die.